Special Equipment: A standing mixer, outfitted with the wire whip attachment; a large saucepan; a candy thermometer. Beating the egg yolks — Separate 8 eggs, pour the yolks into the bowl of your standing mixer, and beat them at medium-low speed until they lighten in color, about 1 minute. Then, with the mixer still running, gradually add the cup of sugar. Set aside while you make the cream base. 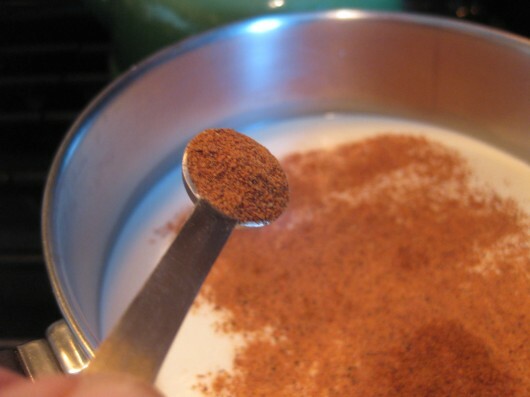 Making the cream base — In a large saucepan set over medium heat, add the 4 cups of milk, the 2 cups of cream, and the teaspoon of nutmeg. Bring just to a boil while stirring occasionally. Remove from heat. Tempering and cooking the yolks and cream — Remember the yolks you left in the bowl of your standing mixer? Start beating them again, but this time at medium-high speed. Then, bit by bit, add the hot cream mixture to the yolks. This will “temper” the yolks, and keep them from scrambling. When all is incorporated, pour the hot liquid back into your saucepan, and heat to 160 degrees. This will take only 30 seconds or so. Remove from heat; add the 3/4 cup of bourbon and the teaspoon of vanilla extract. Chilling the eggnog — Pour the hot liquid into a medium bowl, cover with plastic wrap, and refrigerate for at least 2 hours or overnight. The whipping cream — Just before serving, whip 1 1/2 cups of cream until it forms soft peaks. While whipping, gradually add the 1/3 cup of sugar. Then scoop out half the whipped cream, and whisk it into the chilled eggnog to thicken it slightly. 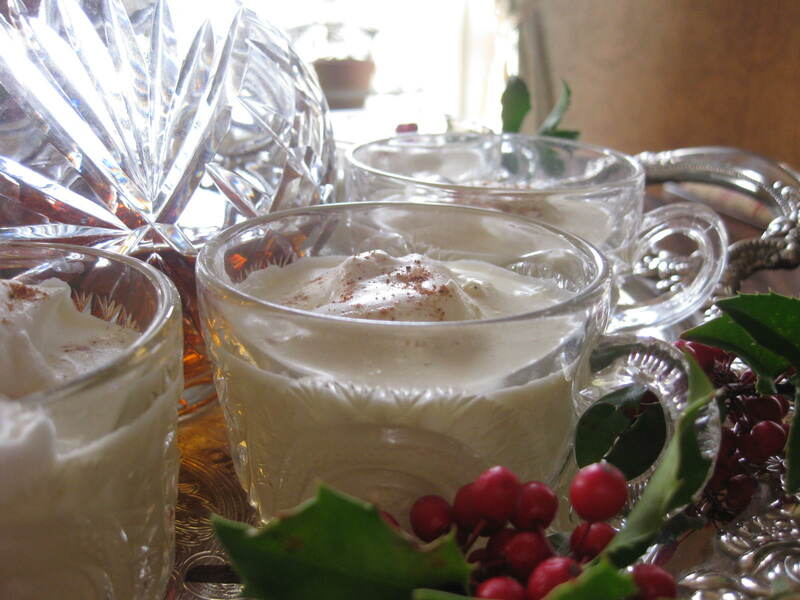 Save the rest of beaten cream for topping each cup of eggnog. Serving ideas – –You can pour your eggnog into a punch bowl or a pitcher, set a bowl of whipped cream beside it, and let guests serve themselves. 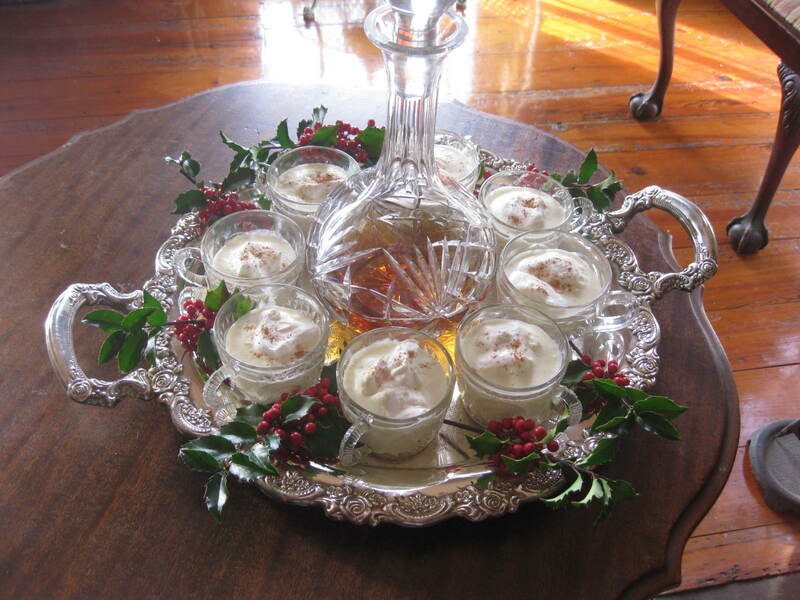 Or, do what I do, and make an elegant eggnog presentation: Arrange tiny glass punch-cups on a round silver tray. Pour bourbon into a pretty glass decanter, and set this in the center of the tray. The bourbon is for guests who want a little more “nog” in their eggnog. For ornament, set sprigs of holly between the cups. 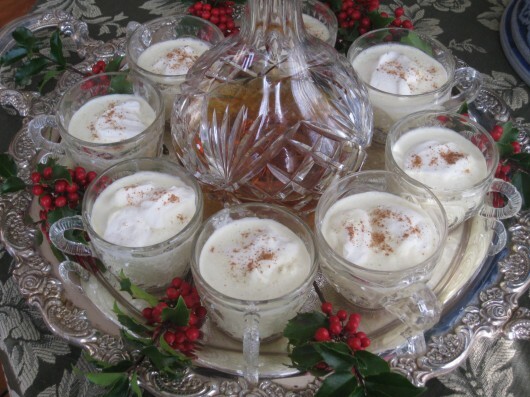 Then ladle eggnog into cups, top each with a dollop of whipped cream and a sprinkle of nutmeg, and bring the tray to your guests. Make this eggnog, and trust me — your guests will love you. That looks so beautiful!!!!!!!!!!!!!!!!!!!!!!!! (and delicious!) Tres elegant! Brenda – Thanks. It is out-of-this-world delicious! 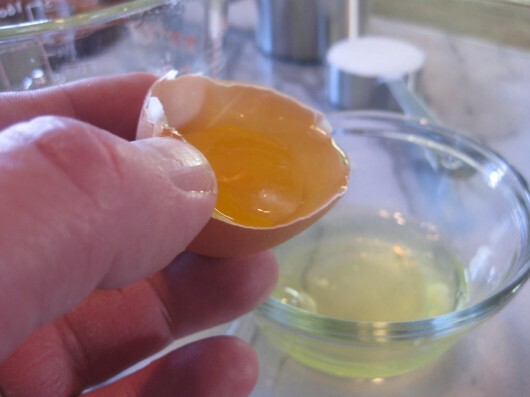 Would you know if heating the egg yolks this way eliminates any danger from salmonella bacteria? (I have a lot of elderly folks visiting and am ultra-nervous about raw-ish eggs, which can be dangerous to the old and/or immune compromised.) Apologies for asking a rather mundane question. Your eggnog presentation is so elegant and I’d dearly love to serve eggnog. Alice — If you cook the eggs to 160 degrees — as I did — any potential salmonella will be killed. Thus you can serve this brew with utter confidence. And it’s SO much fun to make a festive presentation with the cups! Kevin…, YOU are amazing. Viewing and reading from you is “breathtaking”~~~ It is! 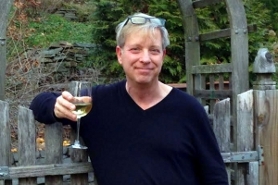 Sandra Lee Robertson – you are too, too kind. Yum. The ultimate winter comfort…even if it is a ridiculous 68 degrees outside! 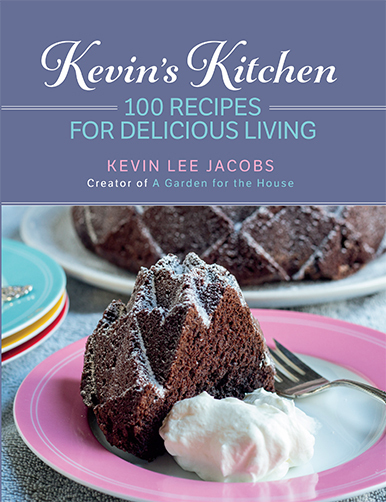 Beautifully presented, too, Kevin.